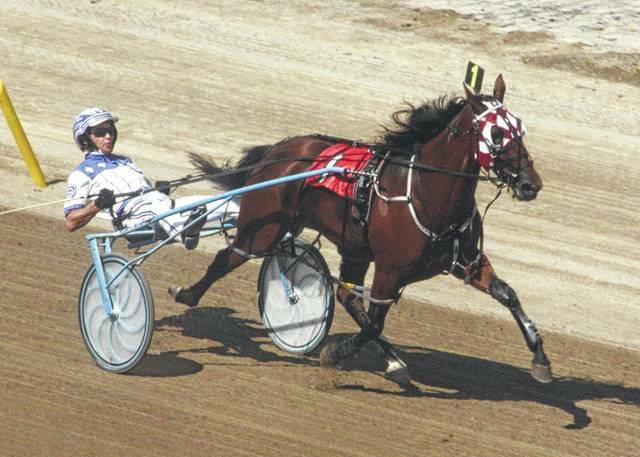 Instructor cruised to victory in the $41,600 Standardbred pace for freshmen colts in Sunday’s Grand Circuit action at the Delaware County Fairgrounds. Mike Wilder sent the gelded son of Rocknroll Dance from post No. 1 right to the lead and led the field through the first three quarters of the mile in :28 2/5, :58 2/5 and 1:27 1/5. Rock N Joe (Chris Page) mounted a slight challenge in the final turn, but Instructor was too tough and won by 1 1/4 lengths in a lifetime best 1:55 3/5. Instructor is owned by Burke Racing Stable, David Wills, Knox Services and Weaver Bruscemi and conditioned by Ron Burke. Bye Hanover took the $34,800 Standardbred for two-year-old filly pacers in 1:58 4/5. When the field of three headed into the first turn, driver Chris Page sent the daughter of Well Said after the early lead, putting Tura Lura Lural (Kayne Kauffman) into the pocket spot second on the rail. Bye Hanover was able to control the fractions of :30, 1:00 4/5 and 1:31. Bye Hanover drew clear of Trura Lura Lural in the stretch to score the 3 ¼ length win. The daughter of Well Said is owned by Richard Lombardo, RBH Ventures, Joe Sbrocco and Hutchinson Harness and trained by Brian Brown. Driver Hannah Miller continued her dominance in the amateur driving ranks with a pair of wins on the card, the Tim Fouts Memorial Pace and the Billings Amateur Trot. In the $5,000 Tim Fouts Memorial Pace, she represented the Yonkers Harness Drivers Club and used a three-wide move in the final turn to win with Banging The Drum in 1:57 1/5. Badger Quinn (Ned Hodkinson) was second and Picasso Forever (Mitchell Walker) was third. Miller guided Pine Tab to a 1:59 4/5 win over Kween Mightus (Gregg Keidel) and Rush N Supreme (Mitchell Walker) to take the Billings Trot. Post time for today’s 13-race card is 3 p.m.
Bye Hanover (Chris Page) takes the $34,800 Standardbred for two-year-old filly pacers in 1:58 4/5 Sunday at the Delaware County Fairgrounds.